Abstract—In recent years, tourism has become the industry which lots of local governments promoted actively in Taiwan. Taiwan belongs to the island so that it has the abundant coastal natural resources that coastal tourism has become a major tourism development. However, coastal areas are mostly within environmentally sensitive areas, when investment and promotion of the tourism development will impact the natural environment, so it is an important topic to discuss. This study attempts to research the extent of the environmental benefits of promoting tourism development actively through data envelopment analysis (Data Envelopment Analysis, DEA) by the view of land development and landscape ecology. Index Terms—Coastal tourism, environmental efficiency, data envelopment analysis. Shu-Wei Huang, Hsiu-I Hsieh, and Ting-Hsuan Chen are with the Department of Environmental and Cultural Resources, National Hsinchu University of Education, Hsinchu City, Taiwan (e-mail: upshuwei@mail.nhcue.edu.tw, nancy2432730@gmail.com, today8213@gmail.com). Hsing-Fu Kuo is with the Department of Tourism, Leisure and Hospitality Management, National Chi Nan University, Nantou, Taiwan (e-mail: luckiekuo@gmail.com). 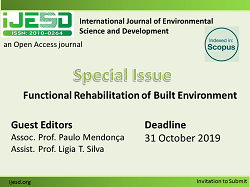 Cite: Shu-Wei Huang, Hsing-Fu Kuo, Hsiu-I Hsieh, and Ting-Hsuan Chen, "Environmental Efficiency Evaluation of Coastal Tourism Development in Taiwan," International Journal of Environmental Science and Development vol. 7, no. 2, pp. 145-150, 2016.